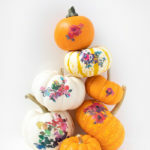 It’s almost the first day of fall, so I really need to get moving on my fall decor! 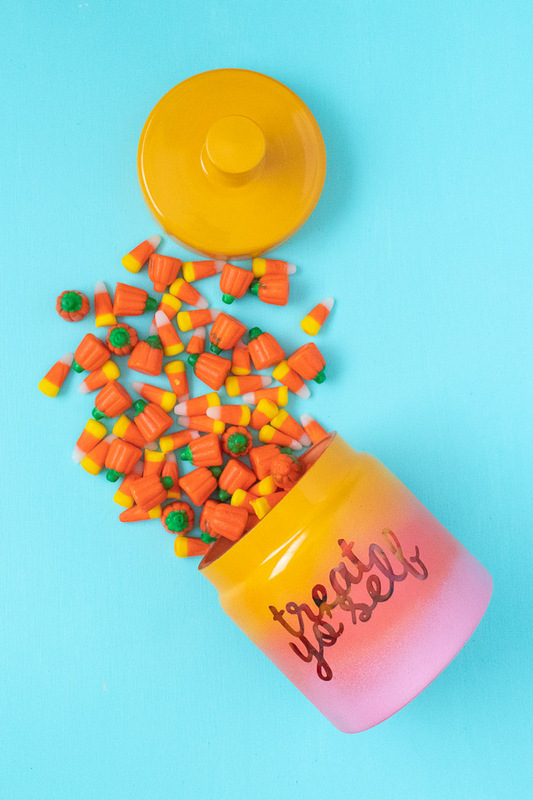 My first step – aside from adding these temporary tattoo pumpkins everywhere – was to make a new candy jar to help fulfill my constant sweet tooth as we inch closer to Halloween. 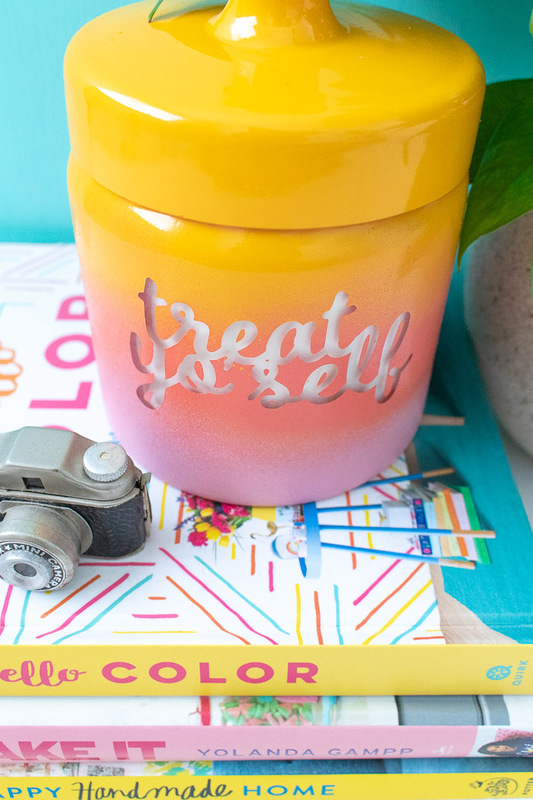 Since I’m not one for the very traditional fall colors, I decided to use three of “my” fall colors to make a simple gradient treat jar complete with a custom “treat yo’ self” saying! 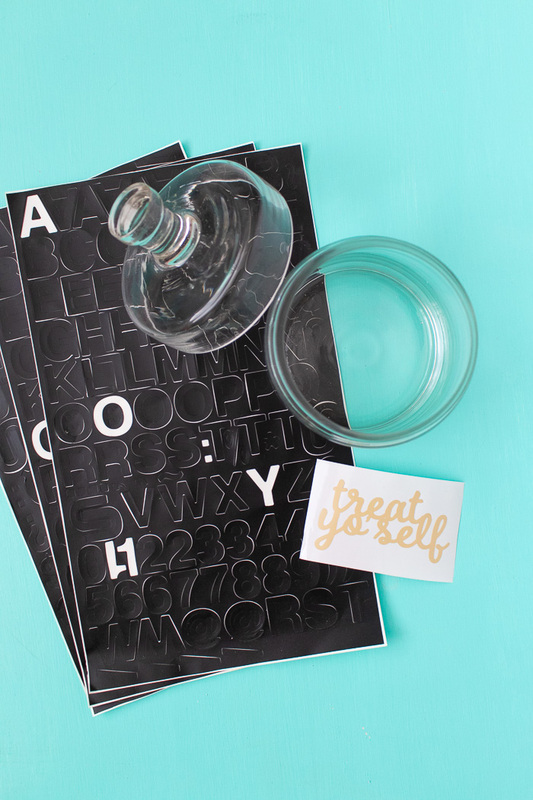 After all, we all need a little reminder to treat ourselves sometimes. It’s probably important to point out that I’m the only person I’ve ever met who actually LIKES candy corn, ha! I eat it throughout the year and purposefully buy it for eating purposes. As you can see, the background of the saying is white. That’s because I inserted a piece of paper before adding candy so it would be easy to see for photos. However, it is actually clear so that you can see the candy inside, which I think is WAY more fun! It just wouldn’t photograph well and I wanted to show off this fun sticker I made with my Cricut (and you can download a copy below). 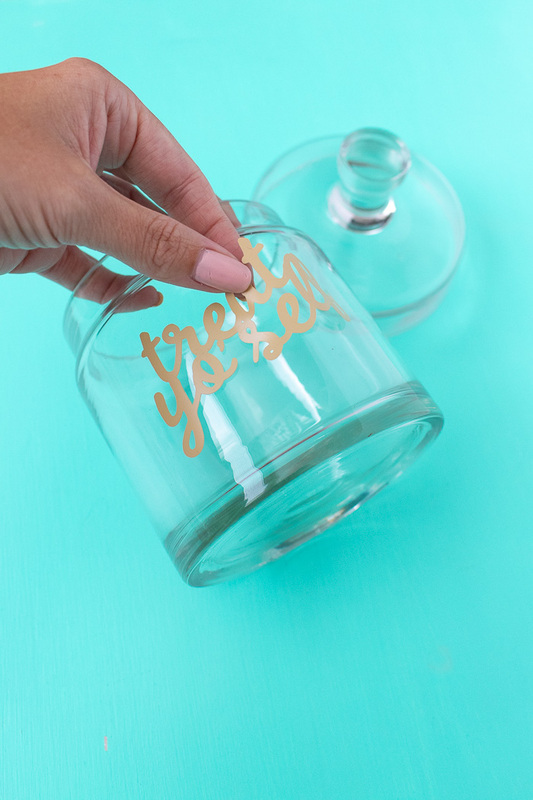 If you don’t want to cut out your own sticker, you can use any stickers to create your desired saying on the gradient treat jar. 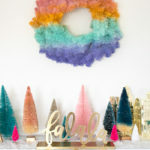 Gradients are perfect for so many projects, and I love the Rust-oleum Candy Pink, Krylon Sunrise and Rust-oleum Marigold paint colors for fall! Step 1: Wipe jar clean. Remove backing of sticker(s) and press on front of jar. Step 2: Remove lid and place both pieces open side down on cardboard or a drop cloth in a ventilated area for painting. 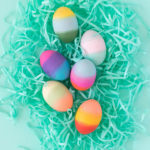 Step 3: I recommend beginning with the middle color. Spray around the middle of the jar about 8 inches away to avoid drips. Step 4: Next, paint the bottom color. 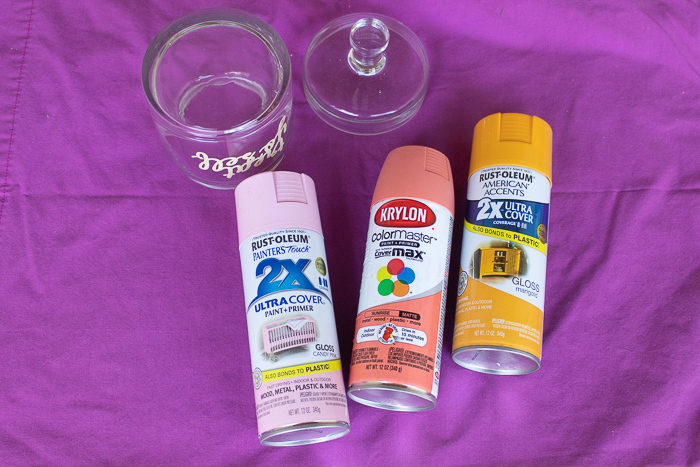 Spraying at an angle may make it easier to contain the paint to just the bottom third of the jar. 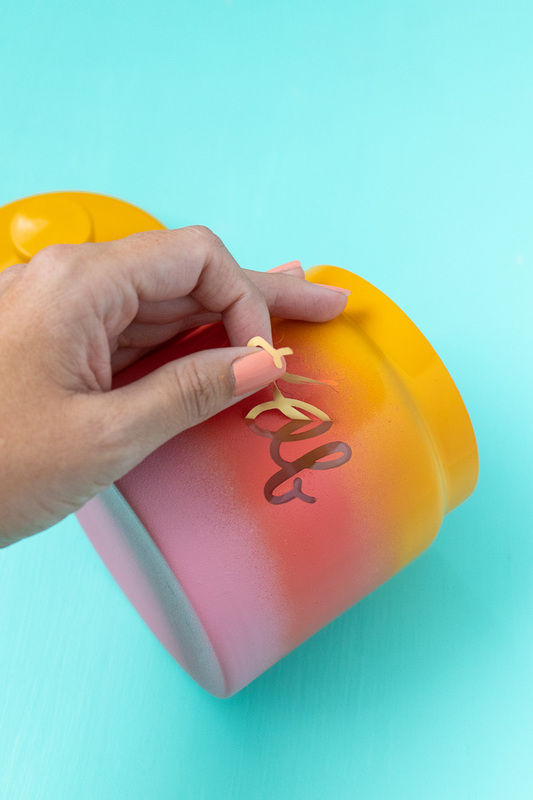 Then paint the top third as well as the lid of the har in the third color. Let dry for one hour and make any touchups if needed. Let dry completely for about 8 hours before moving. Step 5: Carefully peel away the sticker(s) to reveal the saying. 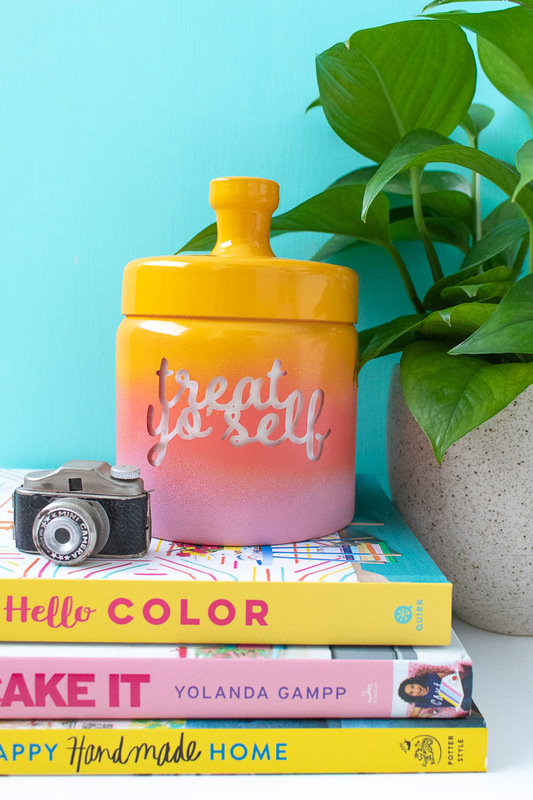 Fill with candy and set on display all fall (or even anytime)! 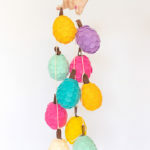 I want to make this DIY project.